Here’s to those who burn the midnight oil finishing up reports and rise with the birds to knock presentations out of the park. This one’s for those who are at the gym until it closes so that their lungs are ready to be filled with alpine air come Saturday morning. For those that simply cannot wait to escape Seattle’s concrete jungle when the clock hits 5 on a Friday, we have good news: Hood Canal is waiting for you in your backyard. The Bremerton Ferry sets sail from Pioneer Square in the heart of Seattle over 15 times a day. 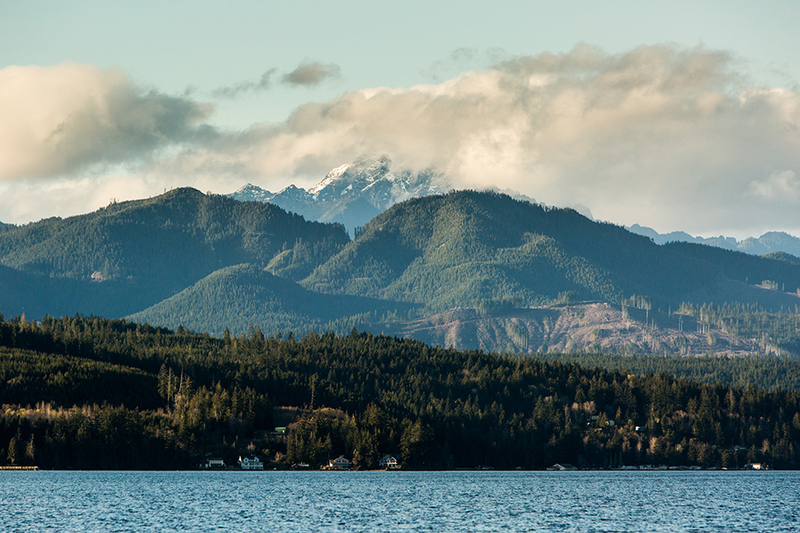 As it scoots around Bainbridge Island, the impressive Olympic Mountains rise ever higher off of the water as your weekend playground draws ever nearer. A short 45 minutes from the Bremerton Ferry Terminal lands you at Alderbrook Resort & Spa. But you’re a weekend warrior—you’ll take the extra half-hour trip to Lake Cushman. Or possibly even forge on a bit further in order to get in the thick of it with a visit to Staircase in Olympic National Park. Breathe in, breathe out. You made it. Waking up underneath behemoth, moss-covered, primordial-looking trees and a tangle of lacy moss is what makes it all worthwhile. And you’ve got two whole diems to carpe! Access to the Olympic National Park is second-to-none from Staircase Campground and it just so happens that some of our favorite biking trails are just down the road. The Lower South Fork Skokomish Trail #873 is bar-none one of the best trails around. If a two-wheeled ride is not your pick of weekend poisons, Mt. Ellinor is a short drive away. An intrepid 6 miles of trail give way to breathtaking 360 degree summit views. And, as one of the more notable peaks in the area, bagging this peak will earn some serious bragging rights. There is a wealth of adventure waiting around every twist of trail in Hood Canal. For more ideas, check out our extensive To-Do list. During a weekend away, we think just about anything is cheers-worthy. The good news? There’s no lack of handcrafted libations in Hood Canal. If you’re a gin or whiskey drinker, The Hardware Distillery crafts some of the best spirits in the Northwest. Their tasting room is open from 11am to 6pm Friday through Sunday. If you find yourself drawn to a glass of wine made with locally sourced grapes as an after-adventure drink, Walter Dacon Wines in Shelton makes some of the best wine in the area and is dedicated to Rhone and Mediterranean styles. Their tasting room is open Wednesday through Sunday from noon until 6pm. As weekend warriors ourselves, we revere those who rise early on Saturday and Sunday to take advantage of the precious weekend freedom. We’d love to see what you get into in our neck of the woods; tag your photos on social media with #wildsideWA, and be sure to find us on Facebook, Twitter, Instagram, and Pinterest for more.